From captain to major, Matthew Neumeyer is an exemplary display of the courage and fortitude found in the Chickasaws. 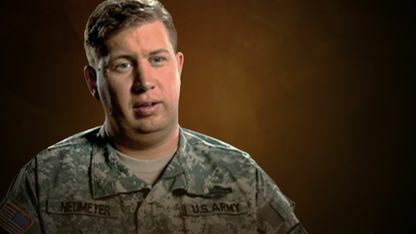 Promoted to lieutenant colonel since the taping of the video, he has deployed to Kosovo, Iraq twice and Afghanistan twice. He and his family now reside in Fort Benning, GA. Growing up in Michigan, Matthew felt displaced from the Chickasaw Tribe even though he was made aware of his heritage. He felt as though he wasn’t a part of the tribe as much as others because he wasn’t able to participate in the tribal activities. But the Chickasaws are a tightly woven group, and when he had his first tour in Iraq, he received a care package from the Chickasaw Nation. That was all he needed to understand the loyalty found in such a special group of people. Knowing this loyalty and camaraderie, Matthew was able to use these ideals to help the Iraqi citizens on his second tour. He showed the citizens the idea that everyone is considered a member of the family. Valor, courage and honor are qualities that everyone wants to have in their lives. Major Neumeyer is a shining example of these attributes and shows what an extensive group of people are a part of the Chickasaw Nation.